(Nanowerk News) Crystalline materials have atoms that are neatly lined up in a repeating pattern. When they break, that failure tends to start at a defect, or a place where the pattern is disrupted. But how do defect-free materials break? Until recently, the question was purely theoretical; making a defect-free material was impossible. Now that nanotechnological advances have made such materials a reality, however, researchers at the University of Pennsylvania and Germany’s Max Planck Institute for Intelligent Systems have shown how these defects first form on the road to failure. In a new study, published in Nature Materials ("Measuring surface dislocation nucleation in defect-scarce nanostructures"), they stretched defect-free palladium nanowires, each a thousand times thinner than a human hair, under tightly controlled conditions. Contrary to conventional wisdom, they found that the stretching force at which these wires failed was unpredictable, occurring in a range of values that were more strongly influenced by the ambient temperature than was previously believed. Left, a defect-free palladium nanowire. Right, the distribution of strengths observed at different temperatures. This thermal uncertainty in the failure limit suggests that the point where a failure-inducing defect first appears is on the nanowire’s surface, where atoms behave in a more liquid-like way. Their increased mobility makes it more likely they will rearrange themselves into the beginnings of a “line defect,” which cuts across the nanowire, causing it to break. The study was led by graduate student Lisa Chen and associate professor Daniel Gianola of the Department of Materials Science and Engineering in Penn’s School of Engineering and Applied Science. Other members of Gianola’s lab, postdoctoral researcher Mo-Rigen He and graduate student Jungho Shin, contributed to the study. They collaborated with Gunther Richter of the Max Planck Institute for Intelligent Systems. The researchers grew palladium nanowires through a vapor deposition method at high temperature, which provided each atom with the time and energy to move around until it found its preferred spot in the metal’s crystalline structure. Sprouting from a substrate like blades of grass, the team used a microscopic robotic manipulator to painstakingly pluck the wires and attach them to their testing platform inside an electron microscope. This platform, developed in conjunction with Sandia National Laboratory, functions like an industrial mechanical testing machine at the nanoscale. 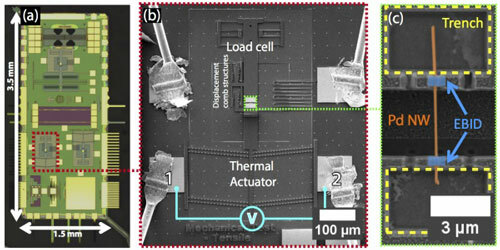 Welding a nanowire to a grip attached to a series of slanted bars that expand when heated by an electric current, the researchers could then stretch the nanowire in a controlled way. By repeatedly ramping up the voltage to a different maximum and bringing it down at the same rate, the researchers could pinpoint when the first irreversible deformation in the wire occurred. Computational studies suggested this point could be revealed by studying the temperature dependence of failure. Absent defect-free nanowires to run physical experiments upon, earlier theories and analyses suggested that the relationship between temperature and strength was deterministic; knowing the temperature would allow one to estimate a nanowire’s failure limit. By conducting their stretching experiments at various temperatures, the researchers were able to chart these failure points. Surprisingly, they found the wires’ strengths scattered over a range of values, even when stretched at the same temperature. That this distribution occurred over a relatively large range of values meant that the thermal activation barrier, the amount of energy necessary to jump-start the nucleation of the first defect, was relatively low. 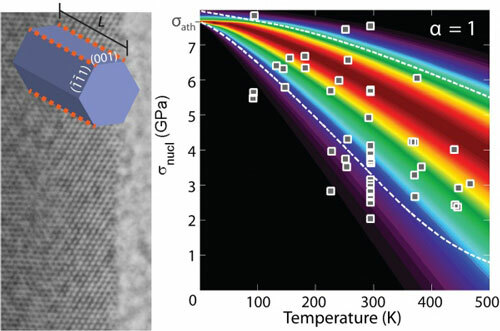 Comparing the size of this thermal activation barrier to other atomistic mechanisms gave the researchers some insight into what was driving this process. Understanding the origin of the distribution of strengths in nanostructures will allow for more rational design of devices.